Harley Davidson Heritage Classic prices start at Rs. 19.89 lakh (Ex-Showroom). Harley Davidson Heritage Classic is available in 1 variants and 5 colours. Share your experiences with Heritage Classic? The claimed ARAI mileage for the Harley Davidson Heritage Classic petrol is 14 kmpl. Q. Anyone please tell me the best harley davidson bike specially on indian roads? Has Harley-Davidson finally backed the old-school appeal of the Heritage with properly modern engineering? For 2018 the Heritage Classic has been completely revised. It now carries a new, more modern design, a new motor and an all-new chassis. The front carries a cleaner look with a large round LED headlamp flanked by two auxiliary lamps, and behind it sits a large detachable windscreen. The tail section includes two large lockable saddlebags with enough space to carry clothes for a week-long trip. It gets the new Milwaukee Eight motor which is more refined and torquier than before. 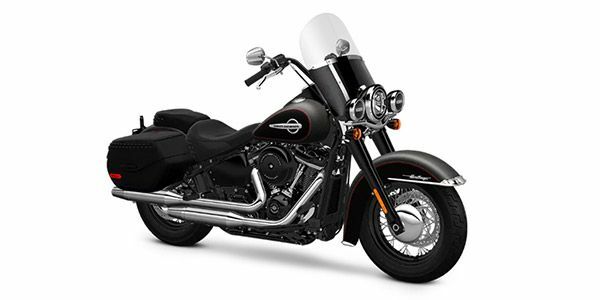 Complementing the motor is the new Softail chassis which is lighter and more rigid. Suspension include new front forks and a rear monoshock shock absorber. Riding position is comfortable thanks to a higher handlebar setup and forward-set footpegs. The seat is very comfortable, though it could be a bit of bother given its softer cushioning. Electronics include ABS but no traction control. Power comes courtesy a new 1745cc Milwaukee-Eight 107 V-twin motor. Harley has developed the motor for more refinement and performance. It makes 144Nm at a low 3,000rpm. Transmission is a six-speed unit with tall gear ratios. Fuel tank capacity is 19.1 litres while the bike weighs 316kg (kerb). Performance stats include a 0-100kmph time of 6.08 seconds and a top speed in the region of 200kmph. Chassis is from the all-new Softail lineup and is lighter and more rigid. Seat height is 685mm while ground clearance is a low 120mm so you do have to be careful while navigating speed breakers. Suspension setup include front forks with Showa dual bending valves for more reactiveness and a rear monoshock damper adjustable for preload. True to the classic theme, the bike gets spoke wheels that come wrapped in 130/90 R16 front and 150/80 R16 rear tyres. Braking is via single discs at both the front and rear. ABS comes as standard fitment. Triumph Thunderbird LT: The Thunderbird comes in both roadster and classic (LT) trim. The LT carries the vintage look well with a large windscreen, saddlebags, whitewall tyres with spoke wheels, swooping fenders and lots of chrome. It costs Rs 16.81 lakh and is powered by a 1699cc parallel-twin motor. Power output is 94PS and 151Nm. Like the Heritage Classic, it too is belt driven. Indian Chief Vintage: Like the Heritage Classic, the Indian Chief Vintage comes with a more accepted V-twin engine layout. It however gets a larger 1811cc motor. Power output is 150Nm, mated to a 6-speed gearbox. Positives are a more authentic vintage look and fantastic quality with high levels of fit and finish. It is priced at a higher Rs 25.32 lakh but is also larger than the Heritage Softail and Thunderbird LT and offers far better quality. The Heritage Softail has evolved into a more powerful, more refined motorcycle with a cleaner design and better appeal. It is a fantastic motorcycle to ride long distances on with your better half, provided you do not encounter speed breakers on your way. It makes sense if you are into cruisers and prefer bikes over cars for those intercity trips.